Our Water Transfer Printing tanks provide efficient & cost-effective solutions for varying levels of production capacity. We offer a full lineup of hydrographics tanks for small business owners and large production facilities. This ensures you get a durable dip tank at an affordable price that caters to your unique processing requirements. All our Water Transfer Printing equipment includes 2 days of hydrographics training at our facility in Princeton, FL. Whether you are just starting your hydrographics business or run a fully automated hydro dipping facility, our equipment options are specifically designed to provide an optimal processing environment. Reduce redo rates, turnaround time, and streamline your workflow with our professional hydrographics dipping tanks. Our #1 goal as a supplier is to help your business grow. Power past your competition with our professionally designed and manufactured Water Transfer Printing tanks. Our Entry-Level Hydrographics Tank features a fiberglass body supported by a steel frame with 6 leveling feet for easy installation. Our Entry-Level system offers a three-stage system with a main processing compartment, reclamation skimmer, and filtration trap with removable filtration material. It includes a digital timer, temperature controls, industrial heater, and a high-efficiency circulation pump. These parts work together to provide good Water Transfer Printing process control and ensure your water stays clean and free of residual activator and film debris. Our Entry-Level processing system is manufactured entirely in the USA. This system is built with versatility and efficiency in mind. Our Entry-Level hydrographic tank is a cost-effective and compact solution that yields high-quality, consistent results. If you are just starting out it makes for a great 1st tank and is backed by a 1-Year Warranty. It is our most popular processing solution for small hydrographics businesses. Lightweight & durable fiberglass tank construction. Large internal processing area of 48in by 24in. Adjustable film baffles reduce material waste. Built in-house and available to ship in 1 week. 2–days hands-on training at our facility in Princeton, Florida. The TWN Entry Level 1.2-meter system is ideally suited for after-market custom processing or light production dipping of small to medium-sized items. We developed this system for fast and efficient processing of firearms, archery products, automotive trim, marine components, and more. This equipment is also used and appropriate for Research & Development labs. Order Your 1.2-Meter Processing System! Our 1.2-Meter Processing System leads the pack in quality, durability, reliability, and affordability. Ready to start your business? Order your 1.2-Meter Processing Tank today! Includes 2 days of training. Looking to scale your small business? Our 1.2-meter activator spray system is the perfect solution for automating your processing workflow. This automatic push-to-activate™ system integrates seamlessly with our 1.2-meter tank. This is the only truly automated activation system that was designed specifically for small businesses. It drastically reduces overspray, activator waste, redo rates, and improves your overall quality and consistency. Our Stainless-Steel Water Transfer Printing Tanks feature durable construction and a large processing area for medium to large processing capacities. With the proper fixtures, this equipment produces quality decoration of multiple small parts. 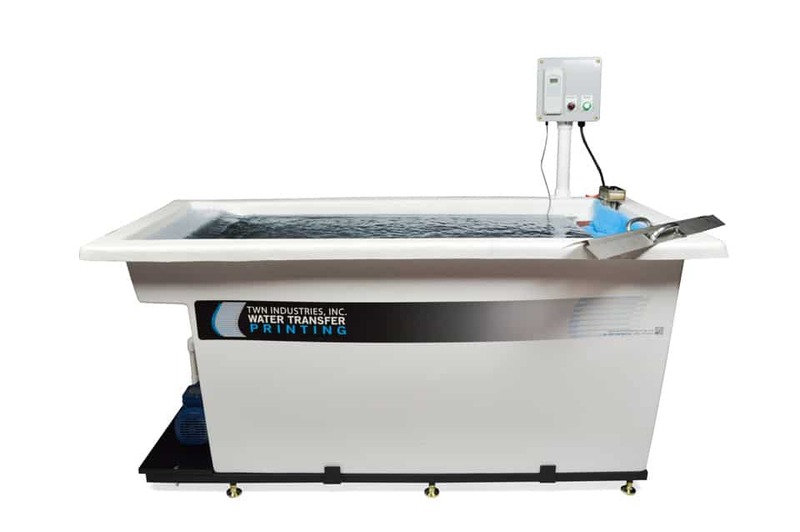 Dipping Arm: An industrial-grade Dipping Arm provides a steady, consistent dipping motion and ensures precise and streamlined processing throughout all dips. This increases your overall output. 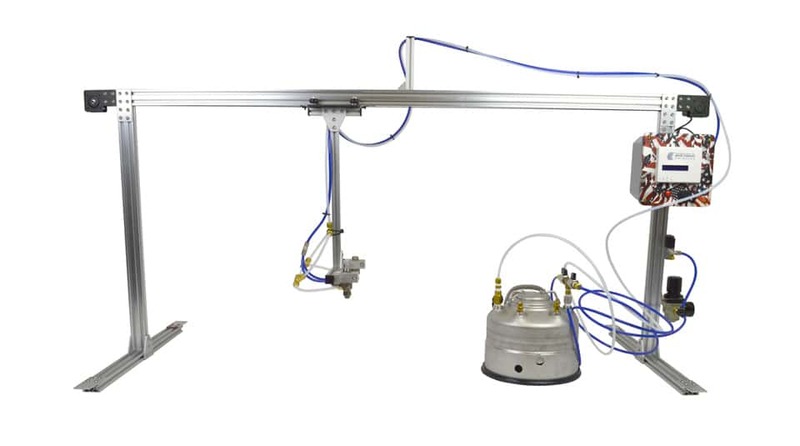 Automatic Spray System: Our Automatic Spray System is fabricated and programmed in-house. This is not like any other activator spray system on the market. With the innovative design and programming, it provides complete control over film activation. Not only does this take the “human error” out of activation, it also uses a pressurized system that saves activator. Filtration trap with removable filter material. Fully integrated with our automatic spray system via an internal trigger. Our line of Stainless Steel Water Transfer Printing tanks is best suited for medium to high-volume production. This is a popular processing solution for OEM’s and companies who wish to decorate large objects like ATV components and long profile parts. You can achieve greater production efficiency when paired with our Production Arm and Automatic Spray System. Purchase of our Entry-Level Water Transfer Printing tank or any of our other equipment options includes 2 days of hands-on training at our facility in Princeton, FL. Here you will learn the entire process, advanced dipping techniques, and common troubleshooting procedures. Join our network of over 1,300 TWN Certified Processors.